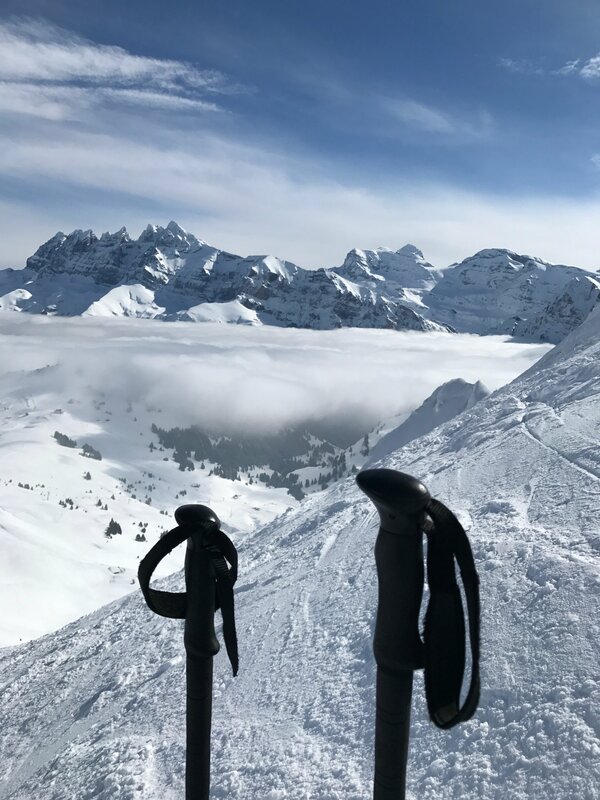 This is an amazing days skiing round the whole circuit taking in some of the 12 resorts that make up the Portes du Soleil. It crosses 2 countries, so you can have breakfast in France and lunch in Switzerland. 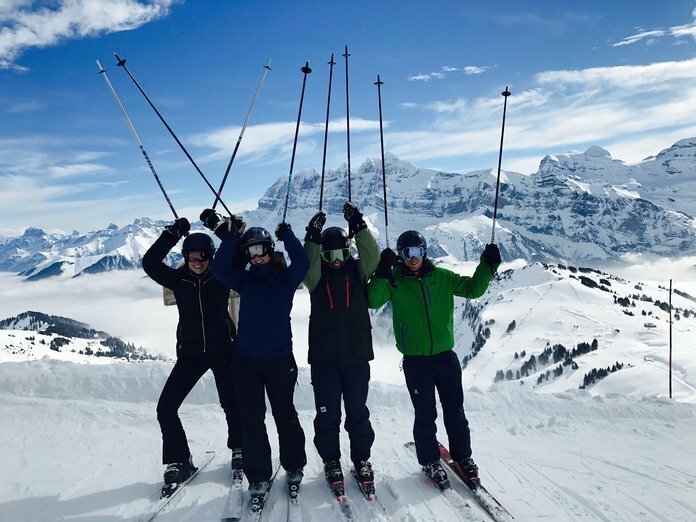 We offer to ski with our guests who are good skiers and competent red run skiers and fit round the circuit where we can enjoy a nice Swiss lunch on route too! There are a lot of drag lifts on the Swiss side so for boarders it can be quite a hard day out but possible! The scenery is spectacular as you are in the view of the Dents du Midi Mountains for half the day. After a hearty cooked breakfast we climb into a minibus at 0830, it’s good to get going early as its about 80 km of skiing to be done and the pressure is always on to get back over from The Swiss side into France at the end of the day! 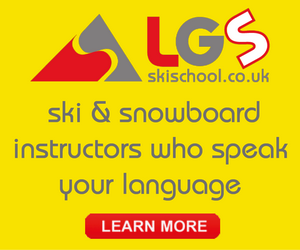 We have 2 options the first and biggest challenge is to ski from Les Gets and the second is to drive to Ardent car park for direct to the Lindaret Valley. The sky is blue, the snow is fresh and it's a bluebird ski day, perfect for the trip. Our driver drops us at The Chavannes lift in Les Gets and with no queues we are straight on it as we rise up the lift Mont Blanc comes into view in the distance. We then ski round the golf course to The Folliet lift and head up and ski down the long blue run to Morzine to the bottom of Pleney, a quick walk across Morzine town and up The Super Morzine lift where the high altitude resort of Avoriaz comes into view we then get straight onto a chair lift in front of us and have a quick easy ski down to the next chair which bring us into the heart of the Avoriaz ski area. Then its decision time do we go clockwise or anti clockwise, I usually go clockwise as its good to have lunch in Morgins in Switzerland. Jumping off the lift at the top of Avoriaz we take a lovely easy tree lined blue run down a few km to Lindaret and then board the Chaux Flaurie lift up into the Linga /Plaine Dranse /Chatel ski area. This is a fabulous area offering a mix of open and wooded slopes. The lifts are fast and mainly 6-man chairs so efficient in getting people up the mountain. 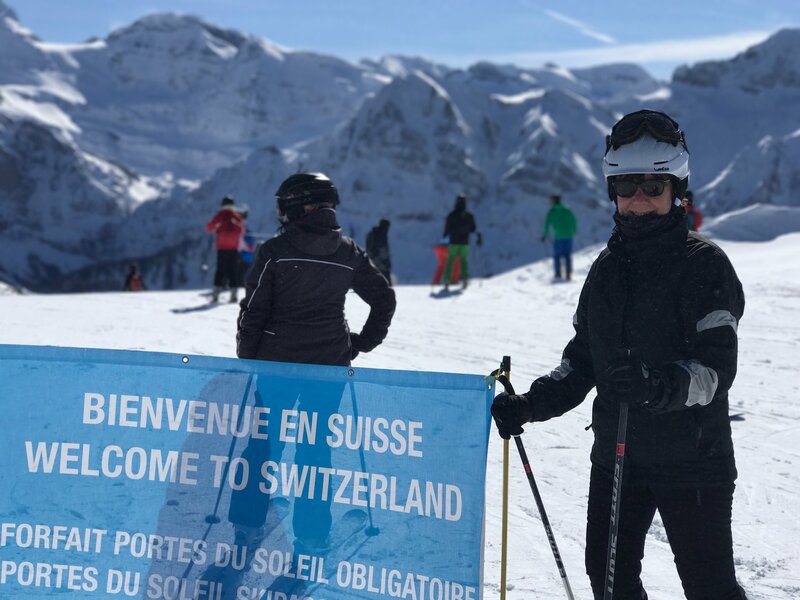 The views are stunning, you can actually see the water of Lake Geneva in the distance and the slopes are north facing so are always in great condition. Once at the top we ski down a red which is quite narrow at first, there is a new blue run option too. The hamlet of Plaine Dranse comes into view with its church and the infamous Chez Babeths restaurant which is like a Christmas novelty shop all year round, well worth a lunch stop on another day if your wallet is full! It’s good to come and see this area and come back later in the week to ski it as you can easily spend a good day or two exploring. We take the Chaux des Rosses lift up and ski down to Les Combes. These are wide open blue and red pistes with generally excellent snow and usually not crowded. After the Combes chairlift there is a blue piste and a red piste heading down towards Chatel. In previous years it was necessary to head down to the bottom and get a bus into Chatel in order to continue. Here on the very long red run down The Tete du Linga it’s time for a loo and coffee stop. I always stop in the charming old restaurant with a huge log fire beside the drag lift, service is efficiently quick, and the hot choc is gorgeous! As you ski down to the new run and chairs on the lovely long red run you can see the town of Chatel in the distance below, it's a much-expanded village with pretty intermediate terrain. After coffee we continue down the red run and then look out for the new run that heads round to the right. This goes to the Gabelou chairlift. This lift goes up and over the mountain (it is used to go both ways and provide skiers from Chatel with access going the other way) and suddenly drops down on the other side. After this lift, the Portes Du Soleil chairlift is directly in front of it. This chair goes straight up to the Super Chatel ski area. Unfortunately, this leaves skiers slightly below the next chairlift that they need to get, so they must head up the Coqs drag lift and then ski down to the Morclan chairlift, located just below the top of the Super Chatel bubble. The Morclan chairlift has a sign on it warning that it is only for good skiers. Do not be put off by this, there is nothing overly challenging from the top. The sign is perhaps in place because the area it leads to is full of old draglifts. Welcome to Switzerland!! And the most amazing view of all the Alps and Mont Blanc. It's an imperative photo opportunity! From the top, we follow the signs for Torgon heading up and over via the drag lifts. From here it is possible to head all the way down to Chapelle D'Abondance, we only do this if we are really ahead of time. The pistes are fab and uncrowded although this does add quite a bit of time to the day and the snow lower down can be patchy. However, if its good conditions and the skiers are quick its possible. Torgon is usually quite empty so is a great place for a quiet ski and a way to escape the crowds in busy periods. The fresh snow usually remains untracked for longer as well. There used to be a restaurant at the top called the Panoramique which offered superb views down to Lake Geneva. The restaurant appears to now be closed, although it is still possible to walk up to it and enjoy the view. This is one of the furthest points you can ski to from Morzine/Avoriaz. From here the journey back begins, although there is still a long way to go. Signs on the pistes now point towards either Chatel or Morgins. Following the signs to Morgins leads to a number of drag lifts with little skiing to be had between some of them, although there are some nice slopes on the way. And you can stand virtually above Montreux at the opposite end of Geneva on Lac Leman.The final drag lift can be confusing. The sign at the bottom says Morgins but at the top the only sign points to Chatel. At the top of the piste, there is a path that heads to the right. This is the way down to Morgins. Towards the bottom of the run to Morgins the snow cover can be very bad. In fact, it is well worth checking beforehand that the slope will be open, as it is often closed late in the season. Morgins is a very pretty little Swiss village (as long as you are facing away from the apartment buildings!) and worth stopping at for lunch, I always stop at the red shuttered restaurant called The Buvette des Sports, it has red shutters and has had the same menu for the 25 years I,ve visited. They do excellent Swiss croutes, thats bread dipped in garlic and wine and smothered and baked in cheese absolutely heavenly! 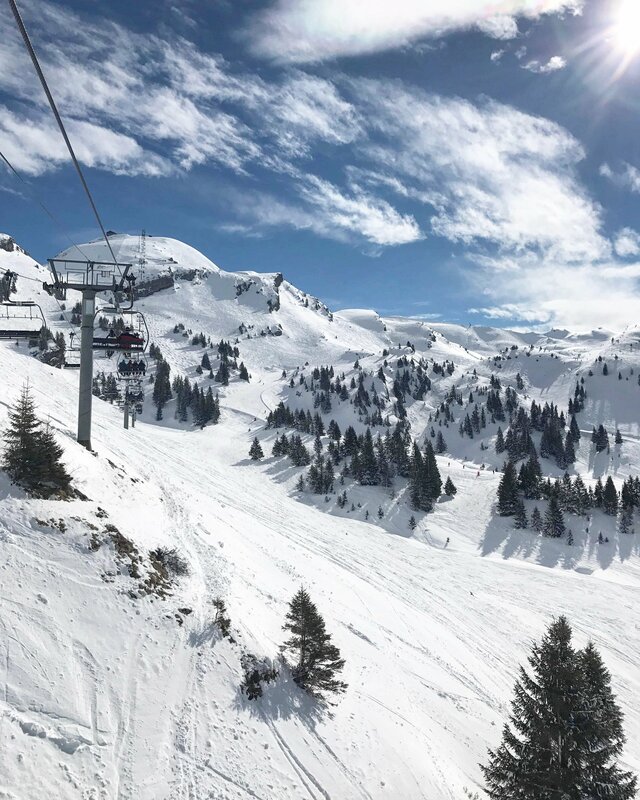 Although if you would prefer to eat in the sunshine then it is better to wait till you get to the top of the next chairlift, where there is a selection of restaurants. You must leave here by 1430 at the very latest to get back towards Avoriaz. After lunch in Morgins, we walk across the road to the Foilleuse chairlift a very old small 3-man chair. From here at the top it’s another photo opportunity of yourselves in front of The Dents du Midi then we ski down to the Bochasses chairlift. At the top of this chairlift there is a sign for Champoussin as well as the first sign heading back towards Avoriaz. 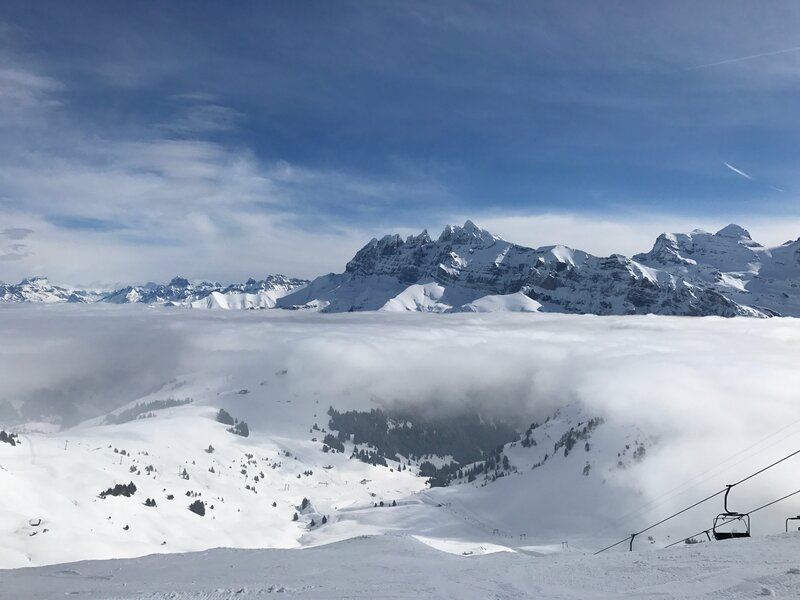 From here the views are my favourite mountain range of the magnificent Dents Du Midi from Torgon onward, but the skiing from Morgins to Les Crosets offers the best views. As with Torgon, these pistes are usually not too crowded. Skiing straight down to Champoussin leads to the Aiguille Des Champeys chairlift. From the top of this lift a red piste leads down to the Pointe de L'Au. From the top of this chair, Les Crosets can be seen. Skiing down to Les Crosets, it’s important to check what the time is and then decide what to do next. If it is getting late then simply head up the Swiss side of the Mossettes chair and ski back down to Lindarets. Alternatively, head up the Grand Conche chairlift and follow the signs for Avoriaz. After one more lift this will lead to the top of the Fornet ski area above Avoriaz. One more run brings skiers back to the Tour chairlift just below Avoriaz, from here you can ski back down to either Lindaret or Prodain where our driver collects us. It has been an exhausting fabulous day out and as we take the last run down to the minibus we stop at La Ferme for a well-earned vin chaud and beer. 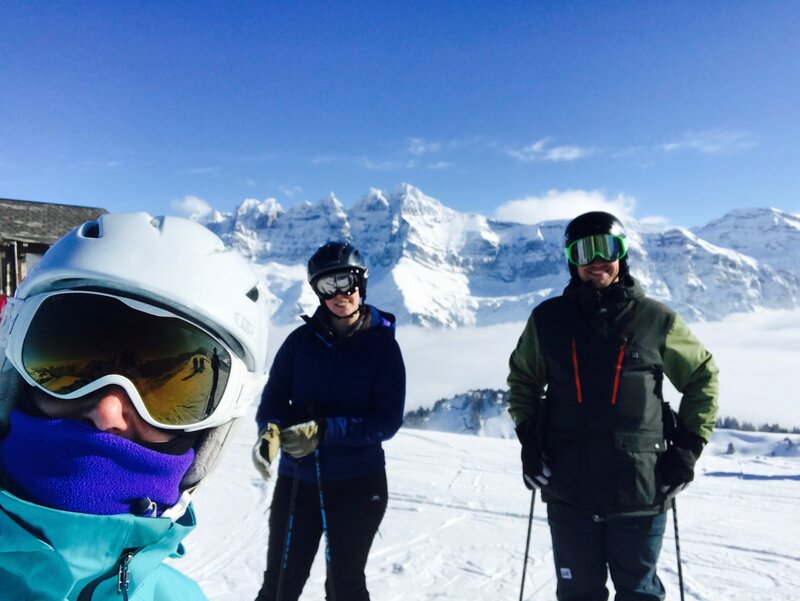 It’s been a marvellous day out skiing the Portes Du Soleil with Jane and Rob.